Peripheral artery disease is a condition where there is inadequate blood flow to reach your limbs due to narrowed arteries. It is one cause of leg pain. People with PAD suffer from leg weakness, numbness, and cramps when they walk. Symptoms typically occur with walking and other types of physical exertion and they resolve with rest. The condition may cause color changes in the legs and may make you feel cold when they do not receive enough blood flow. Smoking contributes to PAD, so if you have the condition and you smoke, you should stop. Medications may help, but some people need surgery for the condition. Another name for PAD is peripheral vascular disease. People with PAD are at increased risk for heart attack, stroke, and coronary artery disease. The pain caused by inadequate blood flow during exercise is called claudication. 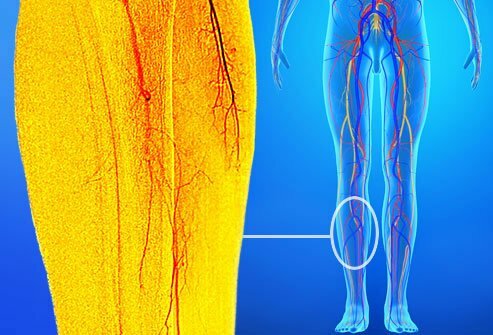 DVT (Deep Vein Thrombosis) is a condition that occurs when a blood clot forms in a vein in the lower leg or thigh. It may or may not cause symptoms. If symptoms are evident, they include swelling, skin redness and warmth, and leg pain. DVT may lead to a potentially life-threatening condition called pulmonary embolism (PE). This occurs when part of a blood clot breaks off and travels to the lungs. Blood clots located in the thigh are more likely to lead to PE than those in the lower legs. Seek medical attention right away if you are experiencing symptoms of DVT. Medications are available that inhibit clots from forming, growing, and breaking off and traveling to other locations in the body. Peripheral nerves are nerves are those that are outside of the brain and spinal cord. Damage to to peripheral nerves causes a condition called peripheral neuropathy. Diabetes is the most common cause of peripheral neuropathy. This is known as diabetic neuropathy. Other conditions can cause it. So can infections and the use of certain medications. Peripheral neuropathy in the legs can cause sensations of numbness, weakness, and tingling (pins-and-needles sensation). 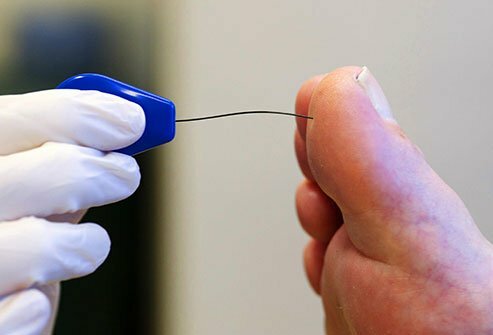 Diabetic neuropathy can also cause foot pain. Treating the underlying cause may resolve the condition. Medications are available to treat nerve pain. Potassium, sodium, and calcium are electrolytes, or salts that help conduct electric current in the body. Electrolytes are necessary for muscles and other systems in the body to work properly. We lose electrolytes when we sweat and physically exert ourselves. Treatments like chemotherapy cause us to lose electrolytes, too. If you lose too many electrolytes, your legs may cramp. You may even experience numbness and weakness. Drink sports drinks to replenish electrolytes. Mineral water and certain foods that contain electrolytes can also replenish these important compounds. If you experience frequent cramps that are not relieved when you replenish electrolytes, see your doctor. This condition causes spaces within the spine to narrow. This, in turn, puts pressure on spinal nerves. This results in symptoms like numbness, tingling, weakness, and pain. Some people also experience balance problems. The lower back and neck are the areas most commonly affected by spinal stenosis. 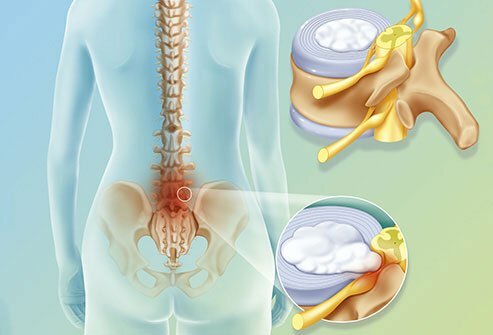 Certain inherited conditions, degenerative diseases, tumors, trauma, and bone conditions may cause spinal stenosis. The condition may be treated with over-the-counter pain medications, steroid injections, restricted activity, prescribed exercises, and physical therapy. Surgery may be needed in some cases. Spinal stenosis may occur when the spine is injured and tissue swelling puts pressure on the nerve roots or spinal cord. An injury to the spine may cause a bulging disc, or herniated disc. This can protrude into the spinal canal. 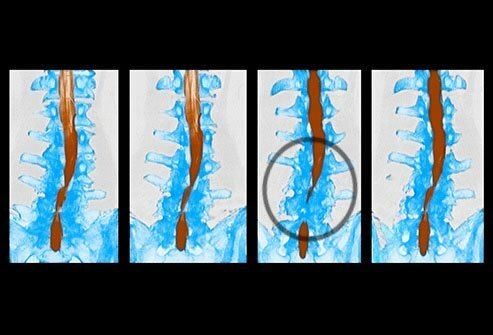 When a herniated disc puts pressure on a nerve root, this is known as a pinched nerve. This results in numbness, tingling, and pain in areas where the nerves travel. Some cases of disc herniation are treated surgically. Radiculopathy is a condition that happens when a nerve is compressed in the spine. When this occurs in the lower back, or lumbar region of the spine, this is known as lumbar radiculopathy. Lumbar radiculopathy is also known as sciatica. The condition is known as cervical radiculopathy when it occurs in the neck and thoracic radiculopathy when it happens in the middle of the spine. Do You Have a Pinched Sciatic Nerve? The sciatic nerve is the largest nerve in the body. You have two sciatic nerves. Each one runs from the lower spine down through the buttock, the back of the thigh, and down to the foot. Sciatica is a condition that occurs when the sciatic nerve is compressed. This results in pain in the hip, back, and the outer leg. Some people experience cramps and shooting pain that may interfere with the ability to sit or stand. A slipped disc, a herniated disc, spinal stenosis, or a slipped vertebra may may cause sciatica. The condition may be treated with pain meds, exercise, physical therapy, stretching, massage, and ice packs. Severe cases may be treated with steroid injections or surgery. Arthritis is a condition that causes pain and inflammation in the joints. People may also experience symptoms like joint stiffness and swelling. Arthritis of the knees, ankles, and hips may make it difficult to walk and do other activities throughout the day. Arthritis cannot be cured but daily exercise and maintaining a healthy weight can help. Over-the-counter pain relievers may ease pain. Heating pads can diminish aching while ice packs diminish pain and swelling. A pulled muscle is a muscle that has been overstretched. Pulled muscles are a common occurrence in people who play sports. A pulled muscle will cause pain instantly and the pain is described as intense. The area is painful to the touch. If you pull a leg muscle, it's a good idea to apply ice packs to the area several times a day for 20 minutes at a time. Take a break in between icing the area. Lightly wrap the pulled area and elevate the affected limb, if possible. Rest and take over-the-counter medications to ease pain from a pulled muscle. Sprains are injuries to soft tissue areas (ligaments) where a muscle connects to a bone. Ligaments that are overstretched or torn are called sprains. 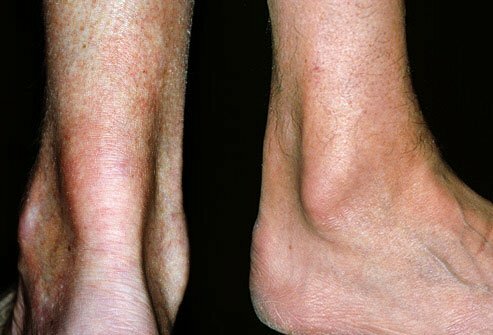 The ankle is a common location for this type of injury. 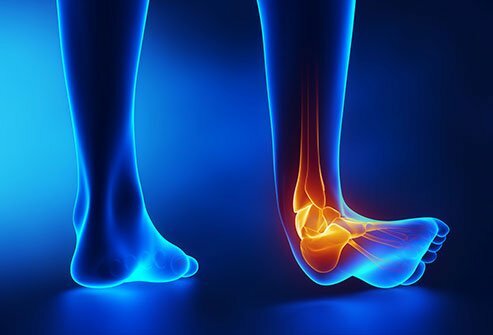 If you have a sprained ankle, you cannot put weight on it and the area is swollen and painful. The recommended treatment for a sprained ankle is Rest, Ice, Compression, and Elevation (RICE). This involves resting the swollen ankle, icing it for 20 minutes several times per day, compression of the area by wrapping the ankle in a bandage, and elevating the lower leg to minimize swelling. See a doctor for injuries to make sure you do not have a broken bone. Do You Get Muscle Cramps? Muscle cramps are involuntary contractions of muscles. You cannot relax a muscle that has cramped up. Muscle cramps commonly occur in the calves and either the front or the back of thighs. Muscle cramps come on suddenly when the muscle gets tight. It may cause a sharp pain and you may be able to feel your muscle in knots under the skin. 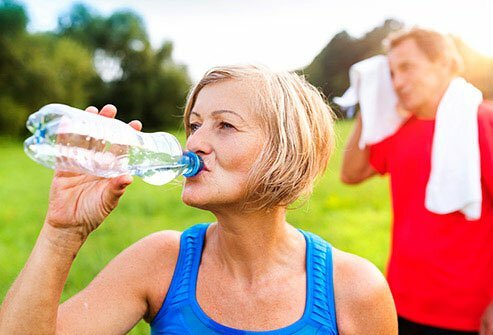 Risk factors for cramps include older age, dehydration, and being out in hot weather. Cramps usually are not a cause for concern, but you should see your doctor if you suffer from them regularly. Shin splints are pains that occur along the inside edges of the lower leg, the shinbone (tibia). Shin splints occur when tissues and muscles in the area become inflamed during physical activity. Runners are frequently affected by shin splints. Risk factors for the condition include wearing ill-fitting shoes and having flat feet or rigid arches. 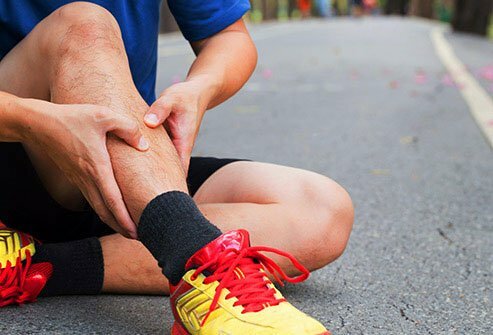 Treat shin splints by resting your legs, applying ice packs to sore legs in 20 minute intervals several times per day, and taking over-the-counter pain relievers to combat pain and inflammation. See your doctor if shin splints do not resolve or if you suffer from them frequently to make sure nothing else is medically wrong. 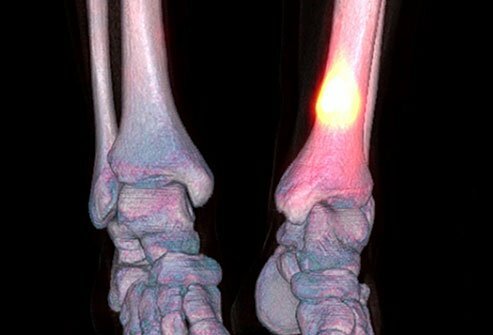 One cause of leg pain in the lower legs is a stress fracture. A stress fracture is a small crack in your tibia (shinbone). When shin splints do not feel like they are getting better, it may be because you have a stress fracture. These injuries are overuse injuries because they occur when muscles surrounding bone are overworked and they do not protect the underlying bone as they should. Treatment for a stress fracture involves staying off the affected limb and resting. It may take between 6 to 8 weeks for the bone to heal completely. It is important to rest if you have a stress fracture. Exercising while the fracture is present can make the injury worse. Tendons are tissues that connect muscles to bones. Tendinitis is a condition where tendons become inflamed due to overuse. The ankles, hips, and knees are frequent sites where tendinitis occurs. Treat tendinitis with RICE (rest, ice, compression, elevation). Over-the-counter anti-inflammatory medications can help relieve pain and inflammation. Ibuprofen and naproxen are good choices. If the pain persists or is severe, see your doctor for an evaluation. Veins are blood vessels that deliver blood back to the heart. Veins have valves that assist the one way flow of blood. When these valves weaken or become damaged, blood may pool in the veins and cause them to stretch. 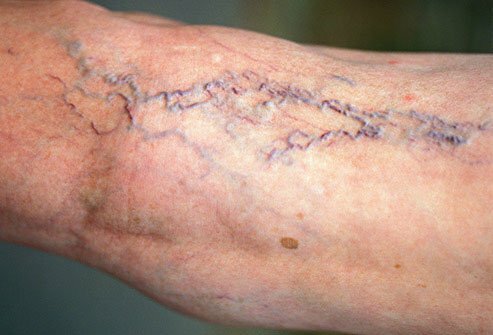 Bulging, swollen, purple, twisted varicose veins result. Varicose veins may cause leg pain, throbbing, cramping, burning, and heaviness. Risk factors for varicose veins include being overweight, sitting or standing for long periods of time, and exercising. Wearing compression stockings can give your legs extra support and decrease the risk of varicose veins. Rarely, varicose veins may be associated with blood clots or skin ulcers. Treatments are available to get rid of varicose veins. Do You Have Burning Pain in Your Thighs? Meralgia paresthetica is a condition in which a nerve in the thigh becomes compressed. This leads to painful burning, tingling, and numbness in the upper thigh. Risk factors for the condition include wearing tight clothes, being overweight or pregnant, or having scar tissue due to surgery in the groin region. Over-the-counter pain relievers like ibuprofen and acetaminophen may provide relief of symptoms. If the pain is severe or lasts for more than a couple of months, see your doctor who can prescribe stronger medication. 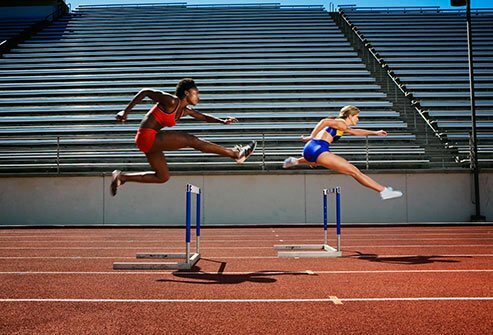 American Academy of Orthopaedic Surgeons: "Muscle Cramps," "Muscle Strains in the Thigh," "Shin splints," "Sprains, Strains and Other Soft-Tissue Injuries," "Stress Fractures." American College of Rheumatology: "Tendinitis (Bursitis)." American Heart Association: "About Peripheral Artery Disease." 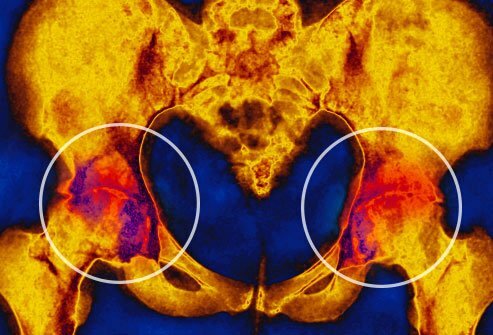 BMJ: "Diagnosis and Treatment of Sciatica." Annals of Surgery: "Meralgia Paresthetica, The Elusive Diagnosis: Clinical Experience With 14 Adult Patients." Journal of Athletic Training: "Influence of Hydration and Electrolyte Supplementation on Incidence and Time to Onset of Exercise-Associated Muscle Cramps." National Heart, Lung and Blood Institute: "What Are Varicose Veins?" "What Is Deep Vein Thrombosis?"